What happens when you indulge in Halloween candy? At Artistic Touch Dentistry, we want to make sure you’re informed on how to make good decisions this holiday season, including how much candy exposure you’re willing to allow for your family. What are the worst food items for your dental health? 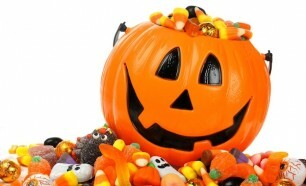 You guessed it… sugary candies, which are in abundant supply at Halloween. When you drink and munch starchy or sugary foods, you’re not only feeding yourself, you’re feeding the plaque that can wreak havoc in your mouth. The sugary foods serve as fuel for bacteria that live in plaque, and the byproduct of their sugar metabolization is acid, which weakens your tooth enamel. To make it simpler, avoid any food that combines sugar, acid, and stickiness. That includes chewy candies like Starburst and Skittles. So before you trick-or-treat and indulge in some sugary goodness, consider this: you’re feeding the bacteria in your mouth! Instead, choose sugar-free candies or fruits. If you do indulge in sugary snacks, be sure to brush 20-40 minutes later in order to cleanse your teeth. Dr. Maryam Brazdo is your dentist for a healthy diet and a healthy mouth!